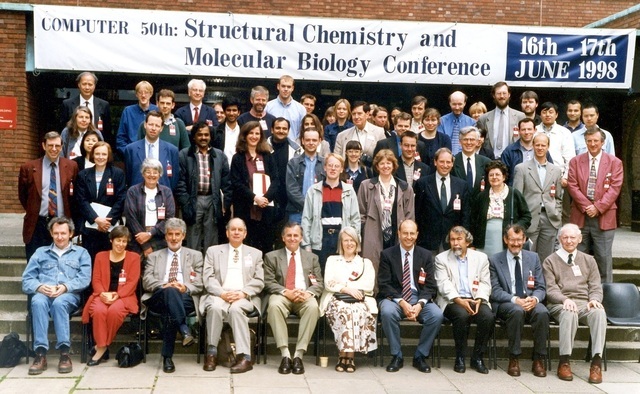 As part of the University of Manchester 50th Anniversary Celebrations of the Birth of the Modern Computer, Professor John Helliwell organized a two-day mini-conference on Computers in Structural Chemistry and Molecular Biology. The highlight of the 1998 Celebrations was the construction of a working replica of the Baby now on display at the Museum of Science and Industry in Manchester. Speakers sitting: Alwyn Jones, Janet Thornton, Frank Allen, Durward Cruickshank, Syd Hall, Eleanor Dodson, John Helliwell, Tom Blundell, ?, Michael Woolfson.